The Berlin Wall was a separation barrier that cut off West Berlin from East Berlin and the surrounding East Germany between 1961 and 1989. It represented the bipolarization of the Northern hemisphere into two antagonistic systems whose ideologies shaped the experience of everyday life. The core representatives of each bloc, the U.S. and the U.S.S.R, fought the Cold War, which ended with the fall of the Berlin Wall and the consequent dissolution of the Eastern bloc. Many political scientists, including Francis Fukuyama, proclaimed that the prevailing regime—the Western liberal democracy—constituted the final point of the cultural evolution of humanity, representing the "end of history. "(1) For Fukuyama, Western liberal democracies had become the archetypal form of government and peacekeeping transnational powers would emerge, inaugurating an era without conflict. According to philosophers Michael Hardt and Antonio Negri, the military campaign led by the U.S. that followed 9/11 challenges Fukuyama's assumption as it demonstrates the continuation of dissent in the post-Cold War landscape. For Hardt and Negri, the current "War on Terror"—as former President George W. Bush named it—encapsulates a "global state of war. "(2) They argue that during wartime, governments temporarily exercise extraordinary powers, and that as war is currently "both global in scale and long lasting, with no end in sight,"(3) its condition is becoming permanent, even perpetual. This circumstance elicits a new understanding of dissent, one without geographical or temporal limit, in which the enemy is no longer a nation-state but an abstraction—for example, a system of beliefs such as the struggle against terrorism. In the global state of war, potential zones of conflict are everywhere, from the streets of New York City to the mountains of Afghanistan. As strife spreads worldwide, governments develop different strategies to impose authority and wall building appears as a popular means to this end. From the U.S.-Mexico border to Israel's Green Line to Italy's Lampedusa, more and more fences and checkpoints are appearing, splitting communities or creating areas of exclusion. The reality is that this type of division currently exists in cities such as Baghdad and Belfast, and between countries including China/North Korea, Cyprus/Northern Cyprus, India/Pakistan, North Korea/South Korea, and Pakistan/Afghanistan. Although different one from the other and varying from crude to imposing, the walls built in these regions segregate populations and restrict movement across both areas of the divide. The Walls That Divide Us examines wall building as the distinctive phenomenon of the post-Cold War landscape. The exhibition looks at the Berlin Wall as the modern variation of historical separation barriers, such as the nineteenth century Great Hedge of India. For example, the Berlin Wall had guard towers placed along its perimeter that surveyed a wide area containing several different defenses. But the exhibition also regards it as the predecessor of the separation barriers that populate the world nowadays, which perform the very same material, normative, and symbolic function. The key theatrical display of the Cold War, the Berlin Wall metaphorically remains an iconographic piece of architecture and the curatorial rationale of the exhibition is that its rise, rather than its demise, is the event that expresses the current age. Therefore, the organizing principle of today's everyday life is not what brings people together, as hoped after 1989, but what keeps them apart, as anticipated in 1961. Gisele Amantea and Ivan Grubanov's works anchor the subject of the exhibition in a historical perspective, drawing attention to the significance of the Berlin Wall in the collective unconscious, yet challenging the celebratory mode associated with its demolition. Amantea presents an elegant, flocked wallpaper of a photograph of barbed wire taken in 1961. She alludes to August 13 of that year, when the building of the Berlin Wall began. That night, a series of fences were set up, initiating the enforced geopolitical frontier that would separate territories and people in the following decades. Grubanov's practice addresses the disintegration of Yugoslavia during the 1990s. He brings together a collection of vintage flags of both the Communist Party and the old Yugoslav federal republics. Bleached from exposure to light, torn and wrinkled, they allegorically evoke the dissolution of the European Eastern Bloc. The thematic framework of the exhibition is further explored with works that address well-known recent examples of wall building. Emily Jacir and Kader Attia call attention to the Israel-Palestine question, one of today's most prominent zones of conflict. Jacir's photographs capture the desolate landscape of the Middle East, focusing on subtle details of the military apparatus that characterizes it. Attia's diptych looks at East Jerusalem, juxtaposing the al-Aqsa mosque, one of Sunni Islam holly sites, with a fragment of the West Bank separation barrier. The US-Mexico border is the subject of the work of Teresa Margolles. A two-channel video documents a performance in which youths attending secondary schools in Ciudad Juárez and Guadalajara allegorically embody the absence of murdered teenagers in Ciudad Juárez in response to the rise in the killing of young adults in the city. Works by Carlos Motta, Leor Grady, Amalia Pica, and Locky Morris deal with the psychological dimension of wall building in relation to political mismanagement. Motta's video examines the fence around Ground Zero in New York City as an example of division, addressing the emotional impact the site has on its visitors. Grady's installation, a composition made up of pillows, refers to the trenches on battlefields, but also to the feeling of safety. Pica brings two strangers together through a string of bunting, the colored shapes of which call to mind insignias and other military imagery, thus evoking feelings of insecurity but also of confidence. Morris's video and photograph allude to the Troubles in Northern Ireland by focusing on the different areas of Derry/Londonderry, including the Bogside, a bastion of resistance against the British presence in the region. The works of Shilpa Gupta and Runo Lagomarsino investigate the frontier as a geopolitical boundary. Gupta has printed the expression "There Is No Border Here" in an adhesive tape similar to those used by the police to close off a specific area. Lagomarsino's slide projected on a screen is based on one of the 2006 proposals for a fence in Ceuta, a Spanish city within Morocco, after the rise of illegal crossings at the border. 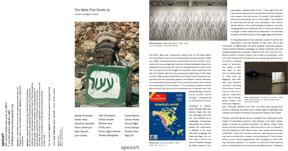 The works of Anna Ostoya and Ahmet Öğüt survey revolutionary movement and protest. Ostoya's collage, made in February 2011, uses newspaper pages from that month marked by the "Arab Spring". Öğüt's installation is made up of ten pedestals and a stone painted in the style of a fighter aircraft's nose, as well as documentation of the placement of nine other designed rocks in the streets of Diyarbakir, his hometown. Immigration is another of the issues dealt with by the exhibition, both from a perspective of diasporic identity formation and the implementation of surveillance strategies between nation-states. Carolina Caycedo collaborated with immigrants living in Shoreditch, London to create a banner conveying the slogan "Immigrants Influence Home Cultures," with which they marched in a celebration of cultural diversity. Inspired by real situations, including an experience lived by the artist, Chen Chieh-jen's video examines the burden endured by most non-Westerners at embassies and border controls of Western countries. The first segment presents the case of eight Taiwanese citizens who apply for short-term U.S visas; in the second part, Taiwan's authorities scrutinize Mainland Chinese who are married to Taiwanese citizens. This work reveals the imperialistic logic still ruling the relationships between countries, usually based on a North/West vs. South/East opposition. The development of an unequal relationship between a metropolitan center and a peripheral territory based on dominance and imperialism is the final topic of the exhibition. The magazine and newspaper covers appropriated by Alfredo Jaar state the dominant position of the U.S. across the globe, particularly after the end of the Cold War, when it became the only superpower. Sam Durant's installation, titled "Colonial Hospitality," explores the self-proclamation of the U.S. as the world's policeman. The U.S.'s regular show of strength is conveyed in Rigo 23's mural painting, which consists of the expression "Fallujah, CA". This is a word game in the sense that Fallujah is in Iraq, rather than in California, and is one of the towns that suffered one of the highest tolls of civilian casualties during the Gulf War in the early 1990s. This exhibition is supported in part by the Conseil des arts et des lettres du Québec and the Mexican Cultural Institute of New York. This exhibition would not have been possible without the collaboration of the artists and Alexander and Bonin, New York; Bortolami, New York; Elastic, Malmö; Labor, Mexico City; and Paula Cooper Gallery, New York. Miguel Amado is currently curator at Tate St Ives, St Ives, UK. He has worked in different curatorial capacities at Fundação PLMJ, the Centro de Artes Visuais, Rhizome at the New Museum, Abrons Arts Center, and the International Studio & Curatorial Program. He has guest-curated exhibitions and projects at organizations including Museu Colecção Berardo, the Fundação Calouste Gulbenkian, Frieze Projects, and No Soul for Sale – A Festival of Independents. He is a regular contributor to Artforum and since 2011 has been a board member of IKT.